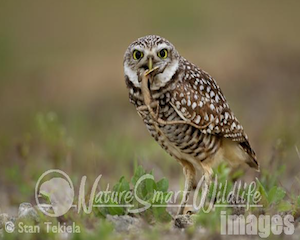 In today’s NatureSmart column, Stan Tekiela shares with us why Burrowing Owls are different from all other owls. I love the rule breakers in nature. People tend to pigeonhole (sorry for the pun) birds and animals into categories not based on facts but on how we perceive them to be. We think that if they are one kind of critter, then they will act a specific way. Owls are a good example of this stereotypical thinking. I have written many times in the past about the Red-headed Woodpecker, which is a species of woodpecker that doesn’t really act like other woodpeckers. This is a good example of a rule breaker. 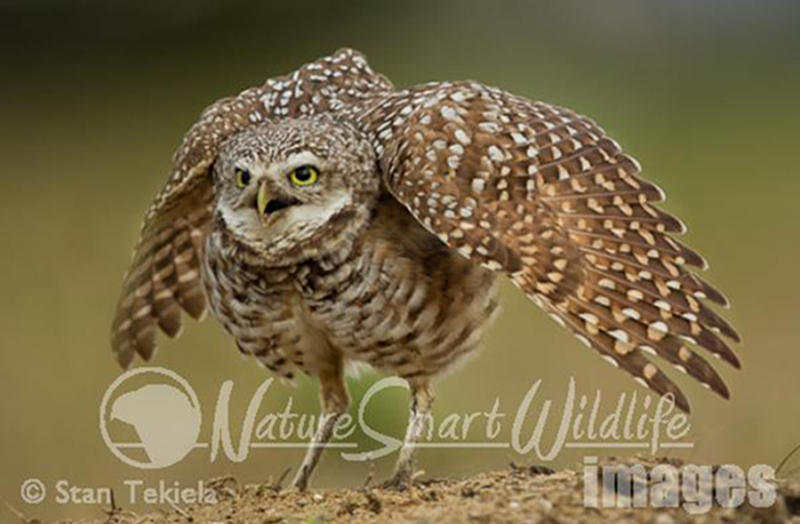 The Burrowing Owl (Athene cunicularia) is another great example of a species of owl that doesn’t behave like other owls. First of all, Burrowing Owls are tiny birds—not the large hulking predators that we often think of when imagining owls. In fact, they are so small (less than 10 inches tall), that they hunt mostly insects like grasshoppers and katydids. So they are not very fierce predators, unless you are a bug. Half of the mystery of owls is their nocturnal behavior. Being active at night means it’s often difficult to see owls. This is not true of Burrowing Owls. They are active during the daytime and at night, making them very easy to see and, more importantly, observe their natural behaviors. Many of the larger insects, such as grasshoppers, are most active during the day, so the Burrowing Owl takes advantage of this and hunts during the day. They will also catch small lizards and snakes, which are also active during the day. It seems this owl is perfectly adapted for the food it hunts. There are a number of owl species, such as the Barred Owl, that nest inside tree cavities. However, the Burrowing Owl is the only one that nests in underground burrows, hence their common name. 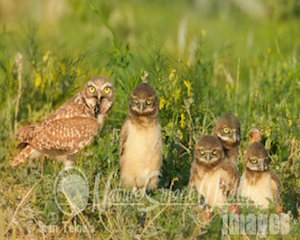 Sometimes the Burrowing Owl will take over an old prairie dog or ground squirrel burrow and widen or lengthen the burrow. Other times the Burrowing Owl will simply dig out its own nesting burrow. Using their tiny feet, they kick loose dirt backwards to excavate their burrows. It can take a fairly long time to dig out their burrows, up to 2 weeks, but they use the burrows for many years in a row, making all the effort worth it. Many burrows are upwards of 6 feet long with a small chamber at the end. They will have extra chambers where they store food. At nesting time, the adults bring in chunks of animal dung (usually cow manure) to decorate the entrance to the burrow. Presumably this will attract beetles and other ground-dwelling insects that the owls then catch and eat. But the birds also collect other objects (like bottle caps) to place at the burrow entrance. Interestingly, Burrowing Owls take well to man-made nesting burrows constructed of PVC pipe or sections of 4-inch drain tile with a small wooden box at the end. This type of apparatus is meant to be buried about 2- to 3-feet deep. The owls seem to like these dwellings and use them often. Burrowing owls also have very long naked legs—much longer than most other owls. They also lack the feathers found on the legs and feet of other owls. This is because they live in warm climates where having feathers on your legs for warmth is not necessary.